Pretty doesn’t have to mean pricey! There is nothing more appealing to me than a day when I don’t have to leave the house, when I can sit and write my articles in peace, wearing my PJ’s all day. I love days when I don’t even have to brush my hair or wash my face. On those kinds of days, there is also no need for makeup. It just feels nice to give your face a break. Unfortunately, I estimate that I get about five days like this per year. The other 360 days require blow-drying, flat-ironing, dressy or casual clothing, and—of course—makeup. Since I’ve gotten older, I find myself very uncomfortable leaving the house without wearing makeup (except if I’m going to the gym). Not that I think I’m ugly, but there is something about wearing makeup that makes most women feel more attractive. Even if it’s just a touch of blush or some lip gloss, making that extra effort to enhance one’s appearance seems to lend a certain confidence boost that, let’s be honest, we can all use! I sat down with Brill, a 25-year veteran in the industry who also has her own makeup line, to talk about inexpensive and quick makeup solutions for busy Solo Moms. Here are Brill’s 11 tips! 1. Invest in a BB cream. Brill says this tip might be her favorite. Short for beauty balm cream or blemish balm cream, BB creams are used to even out skin tone. They have an SPF (or sun protection factor) of 30, and they not only moisturize the skin but also are slightly tinted and have vitamins in them. A BB cream offers coverage, so using one cuts out the need for a moisturizer, serum, and foundation. In other words, it’s a three in one—and it lasts all day! 2. Use a foaming cleanser. Brill says there’s no need for eye-makeup remover if you use a foaming cleanser. As long as your eye makeup isn’t waterproof, you can just wash your face, and the cleanser will remove everything and leave your skin with a nice, clean feeling, not tight and dry. 3. Give bright or deep lipsticks a shot. If you want to amp up your look a little bit, don’t be afraid to change your lip color. Bright and or deep lip colors will pop. You can be subtle with all the rest of your makeup, and you will feel great about how you look. Also, the brighter the lipstick, the whiter your teeth look. 4. Try brow powder. As we age, our eyebrows get lighter and thinner. Brow powder is a product you can use to fill in your eyebrows. You can also use it as a shadow or to get that smoky smudged-eyeliner look underneath your eye. Brow powder stays on the whole day and is a must-have travel product. 5. Bronzer rocks. Want a sun-kissed look? Invest in a bronzer. It can be used on cheeks, as eyeshadow, or as a highlighter below your brow bone. You can also dust the bronzer on your lips. For women with darker skin tones, bronzer can be used to create more even-toned skin and offer a warmer complexion. Bronzers range from burgundy to wine, red, plum, and orange tones. Choose one that will enhance your natural undertones. But don’t just think of a bronzer as adding warmth; its true effect is creating definition in one’s cheekbones. 6. Introduce yourself to a cream eye shadow. Brill says cream eye shadows are life changing. You can layer them. 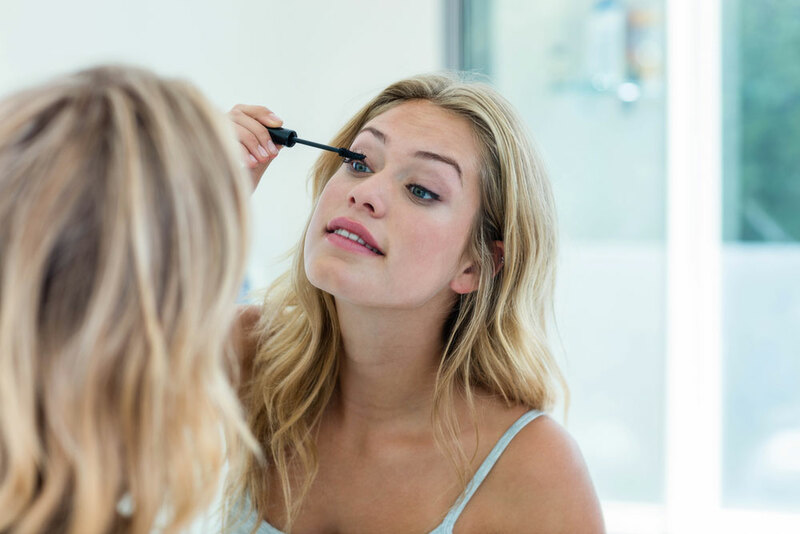 In other words, you put it on your eyelid and then if you are going out at night, you can apply a second coat that will make the cream shadow brighter or deeper, depending on the color. You can also use a cream shadow as an eyeliner to get a smudged look under your eye. And when you use a cream eye shadow, you are eliminating the eye shadow base color. 7. Try a color stick. This is a product you can use on your cheeks and/or lips. The colors are bright but sheer. If you are in a hurry and want to give yourself a natural glow, a color stick is a great option. 8. A must-have: Vacation in a Bottle. Made by Divaderme, Vacation in a Bottle is an oil-free spray that smells great. The product comes with an application sponge and can be used on the body or the face. Meant to offer a “natural glow,” Vacation in a Bottle stays on all day and does not rub off. You can use it instead of your foundation. For women of color, Vacation in a Bottle can be used to even out skin tone. It will also brighten your skin to add a beautiful glow. This is a great alternative when you are looking pale and need a little zoom but you don’t have time to sit in the sun. It takes about two days to wash off. 9. Invest in a lash grower. Brill said that when women reach their 30s, they start losing lashes, and their lashes get lighter. What’s nice about a lash grower is that you simply brush it on every morning before mascara. The product provides a three-month supply, but Brill says the difference is clearly noticeable in four weeks. 10. Be yourself. Keep it simple and just be yourself. If red lips are your thing, then that’s who you are. If you are used to showing off your eyes, go for it! What makes you feel the most attractive is what you should highlight. 11. Lips are key. When on a date, always have something on your lips. If you don’t like lipstick, try a lip gloss. Why? Because when you are talking, people look at your smile and your lips, and lipstick and/or lip gloss can enhance them.